That’s because it’s not intended as a Desktop Search replacement instead it’s more for searching large repositories of fairly static data. The index isn’t updated unless you specifically update it and the index isn’t loaded unless you try and search it, so there is no performance impact to people who never need to use the indexing functionality. You can create multiple indexes and indexes can be shared over network drives with other people (searched concurrently) and, most importantly, the searches are sub-second ‘Search-as-you-type’ speed operations. Personally I’ve been using the indexing feature for searching an archive of over 15 years of emails. I have a scheduled task that runs once a day updating the index and I now use it more than the Outlook search. I still use the ‘classic’ FileLocator Pro interface more frequently because it’s more suitable for source code searching, which is exactly how it was planned. The index feature is just another search method you can use when it’s appropriate for you. To allow for easier reading of results keywords can now be highlighted in separate colors. The colors and font adjustments can be customized or even switched off in the Color Settings. A highly requested feature multi-line regex, ie regular expressions that can span multiple lines, is now possible with a new expression type ‘Multi-line Regex’. When searches take a long time it’s not always obvious why. Version 8 adds a new ‘window’ into the search engine with the Search Threads pane. It displays which files are being searched and how long the search is taking, and it even let’s you cancel individual searches. FileLocator Pro has always defaulted to a two phase search process, step 1 collect the file list, step 2 search the file list. This has the advantage of being able to show accurate search progress for step 2, and works well for smaller searches. However, on larger searches it can be confusing because it appears to show the search going past locations of expected hits. The new multi-phase searching method immediately searches files as soon they are discovered without waiting for the initial collection phase to finish. When the collection phase finishes the UI then starts displaying accurate progress information, just like it used to. The effect is to make all searches, including small searches, just that little bit faster. you can add it to FileLocator Pro. Run reports from the command line. Additional warnings for common search mistakes. Stability improvements for Word and Excel searching. Fuzzy search option, using the LIKE functionality to provide approximate term searching for every term. Search-as-you-type for the internal viewer. Various bug fixes – such as scrolling issues on Hits tab, date/time parsing with custom formats, disabling inappropriate criteria for Basic searches etc. And with all this there has been an ever vigilant attitude to performance. All comparable searches are as fast if not faster than previous versions of FileLocator Pro. For any customers still using Windows XP I’m afraid Version 8 does not support it. Sorry. And, of course, they’ll be other improvements driven by your feedback. I hope you like the new changes, some of this work was started over four years ago. As always my thanks go out to you, our customers. Your enthusiastic requests, bug reports, and general support keep making FileLocator Pro better and better. Update – 8 Apr 2016: So, why did we add indexing functionality? FileLocator Pro works great, Windows Search can be switched off, everyone’s happy. Right? If you use FileLocator Pro for source code searching or some other text format that’s constantly changing or hard to index you probably won’t use the indexing feature. However, if you imagine the scenario of 20 telephone reps each searching a 10GB data repository sitting on a network drive, multiple times every hour, you can see that if you’re not careful the network is going to be swamped with traffic. Or that if you were a lawyer searching through 50GB of case files looking for relevant references, wanting to quickly drill down on searches with sub-second response times, a traditional FLP content search might be cumbersome. You can think of the indexing part as just another tool in your toolbox. A light weight cordless drill that’s good for many tasks but not if what you need is the power of a corded hammer action drill. I also want to say that this a v1.0 when it comes to the indexing component. There is much more we can do with it and this will be driven by customer feedback. Very glad to hear this updated news about the new index component. Looking forward to giving it a try. I am excited to try out your new indexing feature, as I also have a sizeable corpus of email that I search. Thanks for the update! We have a new colour settings to set the colours of various things, which is all very nice – but where is the option to turn OFF the syntax colouring? When I’m searching for specific text in source files, I really don’t want to be distracted by the different colours used for syntax colouring. Maybe next version …? You can switch off color settings, simply uncheck ‘Highlight keywords with different colors” in Color Settings. If you want it to be the same as 7.5 then also switch ON ‘Bold’ and ‘Underline’. Eg I search for the word “length” in *.c, and regardless of the Color Settings, or how the word “length” is displayed, C key words like “while”, “do” are always in blue, numbers are always in orange etc. I understand that syntax highlighting can be useful, but I find the extra colouring to be a distraction, and suggest that it should be optional. So with Windows XP there are real hard incompatibilities? Or you just don’t support it and forbid the installation to be safe, but actually most features would probably still sort-of work? It was getting harder and harder to keep compatible, although we squeezed 7.5 to supporting XP we still weren’t getting 100% compatibility. It’s unfortunate but with Microsoft dropping support for XP and the very lower number of customers using the OS it just doesn’t make financial sense spending valuable resources working on XP compatibility. OK, it’s understandable for sure, I’d just prefer that as long as there aren’t hard incompatibilities in the core of the software or of the installer you allow the installation, maybe after a big warning that it’s unsupported and any support requests will be denied. This is great! However, I have a workflow suggestion: there should be no separate ‘indexing mode’, just a button to build/update an index, which will then speed up subsequent searches if present. If any files have been added/removed/changed since the index was built, the engine falls back to normal search for those files. This would work great for searching code; in any given week you only touch a tiny fraction of a large codebase. And if too many files have been changed you could display an “index outdated!” warning. Nice idea but the trouble is that to know the change would require either scanning the folders in the first place, reducing the efficacy of the index, or by having a background process detecting and recording changes. The latter is the standard index ‘way’ and we’ll look into at least having the option but not as an always-on type process. 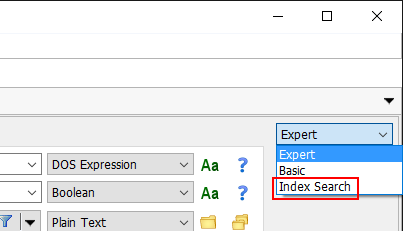 Could you please explain, in the help document, HOW TO GET TO the Index Manager? I’ve figured it out based on the screenshot above, but it should not have been this difficult. Yep, sorry. Consider it done. I’ve just downloaded v8 and paid for another five years. I use FileLocatorPro frequently and find it very helpful. I’m obliged to use Outlook for work e-mail, but I choose to use Thunderbird for personal e-mail, and have a large archive of Thunderbird messages, so I’m interested in any further support for Thunderbird that you may add. Thanks. Thunderbird support is a priority for the 8.x release schedule. Just started using Version 8. Indexing worked fine, and very fast. Is there an update index feature, or does it have to reindex the entire machine? In future, will their be an option to leave index feature on so that changes to index are made as you go? If you ‘update’ the index it’ll only re-index changed files but it does scan all the folders looking for changes. We will have an ‘auto-update’ feature in future but we need to be careful because this is just the type of indexing that many people don’t like. The new indexing feature is great! We archive projects on a web-server, and access the files using a browser or webDAV. With webDAV we can mount the web-server’s file-space as a drive, e.g., z:. Using File Locator Pro, a non-indexed search takes 3.5 minutes. An indexed search takes less than a second. It takes less than 3 minutes to build the index. I’ve used File Locator Pro for years, and it’s a great tool. I recently saw an announcement about the indexing. I realized it was just the type of solution we were hoping to find, to search that archive. P.S. I forgot to mention that what makes having an index so useful for us is that the webDAV connection is so slow. The archive isn’t big (e.g., less than 10GB). Searches without the index take forever due to the slow access over webDAV.